In December 2013, Rodney Local Board (RLB), with support from Auckland Tourism Events and Economic Development (ATEED), commissioned the New Zealand Tourism Research Institute (NZTRI) at the Auckland University of Technology to develop a five-year Visitor Strategy for the north-western area of the Rodney Ward. The focus of the North West Rodney Visitor Strategy 2015-2020 is on improving visitor spend, raising awareness of the visitor industry for both visitor and community alike, and increasing levels of collaboration between key stakeholders in the tourism industry. Fundamental to this Strategy is the need to provide sustainable livelihoods for local residents and enhance their quality of life. 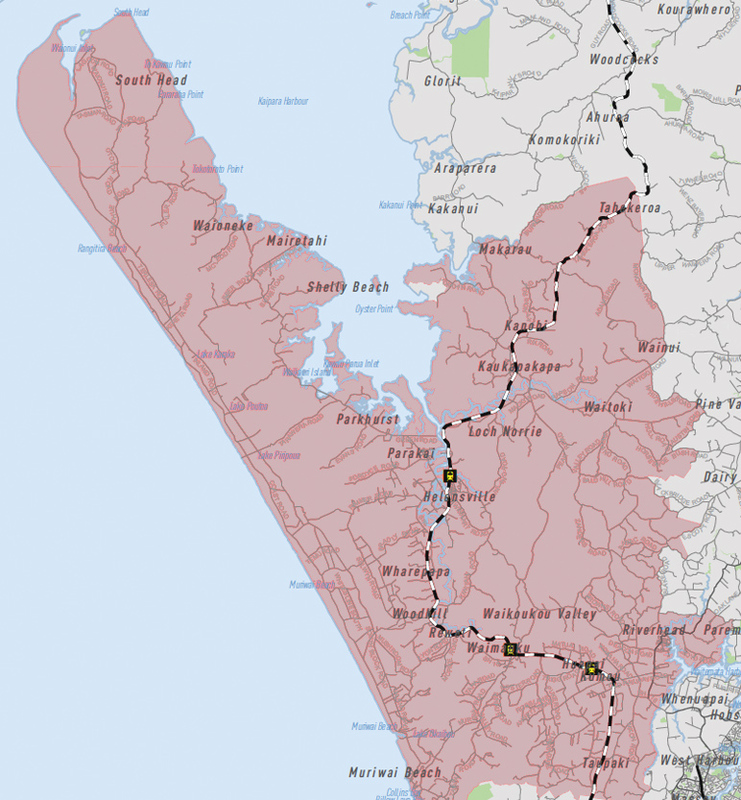 The geographic area covered by this Strategy (see Figure 1) stretches from Taupaki in the south through to Glorit in the north, and includes Muriwai, Kumeu, Riverhead, Waimauku, Huapai, Helensville, Parakai, Kaukapakapa, Shelley Beach, Makarau, and South Head. If you would like to find out more about the project you can contact the NZTRI research team (Carolyn Deuchar on 09 921 9999 extn 8892 carolyn.deuchar@aut.ac.nz). Welcome to the Puhoi to Pakiri Region Visitors Survey. This survey is focused on non-resident visitors to the region including those that are staying in holiday homes (rented or owned). If you are a permanent resident or a business owner in this region, could you please return to the home page where you will find more information about upcoming surveys of interest to you. Participation is entirely voluntary - to participate in this research, simply click on the [take the survey] button below. The survey asks a number of questions where you simply click on your answer from a range of options given. Some questions ask you to type your comments in your own words into the box provided. We would appreciate if you could fill this survey out as accurately as possible. All questions are optional. This survey will take approximately 15 minutes to complete. All answers are confidential and can in no way be linked to your personal details. By taking the survey you are giving consent to be part of this research. Aggregated results of this research may be used in journal and conference publications. A summary of the results of this research will also be available on www.nztri.org in mid 2011. Concerns regarding the conduct of the research should be notified to the Executive Secretary, AUTEC, Madeline Banda, madeline.banda@aut.ac.nz phone 09 921 9999 ext 8044. Welcome to the Puhoi to Pakiri region visitor strategy research �Community Survey�. As a permanent resident of the region, you are invited to participate in this Community Survey. If you are a visitor to this region (including those that are staying in rented or owned holiday homes) we would appreciate if you could complete the Visitor Survey instead of this Community Survey. Please return to home page for the link to the survey. This survey will take approximately 15 minutes to complete. All answers are confidential and can in no way be linked to your personal details. By taking the survey you are giving consent to be part of this research. If you also own a business in the Region we would appreciate your input for the Business Survey as well. Please return to home page for the link to this survey. Welcome to the Puhoi to Pakiri Region Business Survey. The aim of this research is to gain a better understanding of the visitor industry in the region and to develop a visitor strategy that can enhance benefits for local communities and businesses. The survey is focused on all businesses, not just those directly involved in the visitor/tourism industry. If you are a permanent resident, you are also invited to fill out the Community Survey which can be found on the home page. In addition, can you please remind your guests and visiting clients that they can complete the Visitor Survey on the same page. Participation is entirely voluntary - simply click on the [Take the Survey] button below. The survey asks a number of questions where you simply click on your answer from a range of options. Some questions ask you to type your comments in your own words into the box provided. We would appreciate if you could complete this survey as accurately as possible. All questions are optional. This survey will take approximately 10-15 minutes to complete. To thank you for your participation, you can go into the draw to WIN a lunch voucher for two at Ransom Wines, valued at $60. Enter by completing the prize draw section at the end of the survey.